Fish and chips is the classic English take-away food and is the traditional national food of England. It became popular in the 1860’s when railways began to bring fresh fish straight from the east coast to the our cities over night. The fish (cod, haddock, plaice) is deep fried in flour batter and is eaten with chips. 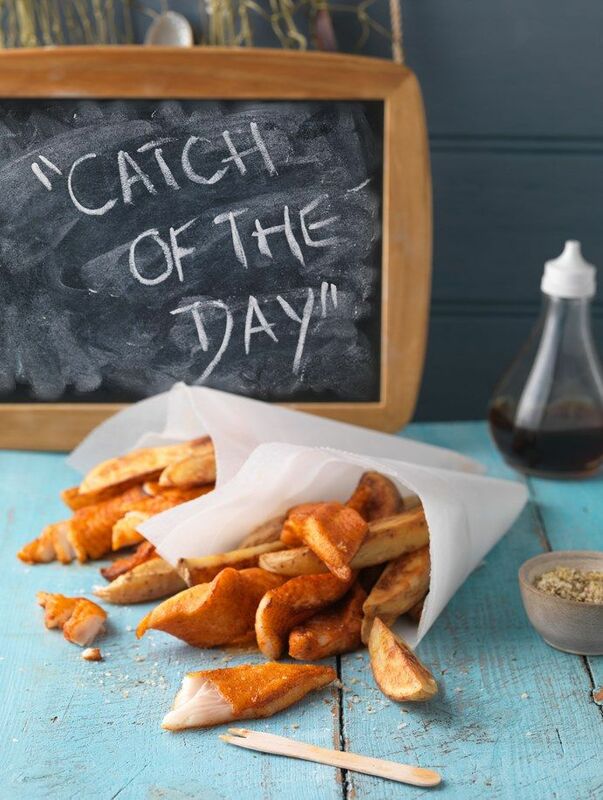 Traditionally, the fish and chips are covered with salt and malt vinegar and, using your fingers, eaten straight out of the newspaper which they were wrapped in. Now-a-days small wooden forks are provided and the fish and chips are wrapped in more hygienic paper. In the north of England, fish and chips is often served with “mushy peas” (mashed processed peas). 1. Approximately 10% of all potatoes – 500,000 tonnes – eaten in the UK are sold through fish and chip shops. 2. In Scandinavian countries, fish and chips are called “fiskefilleter”. 3. Charles Dickens mentions a “fried fish warehouse” in Oliver Twist (1837). 4. Most of Sheffield’s chip shops give customers free Henderson’s Relish, a locally produced sauce resembling Worcestershire sauce. 5. London’s plush Dorchester Hotel has fish and chips on its menu. 6. While not exactly a health food, fish and chips does provide the body with protein, fibre, iron and vitamins. 7. More than 250 million portions are eaten in the UK every year. 8. New York has four fish and chip shops; the first to open was called “A Salt & Battery”. 9. For one of its parties, the Yorkshire Society of Singapore imported not only the fish and chip ingredients but copies of the Yorkshire Evening Post to wrap them in! Preheat the oven to 150C/Gas 2 and preheat the oil to 120C. For the chips, peel the potatoes and cut into whatever size you prefer. Wash well in cold water, drain and pat dry with a clean tea towel. Put the potatoes into the fryer and allow them to fry gently for about 8-10 minutes, until they are soft but still pale. Check they’re cooked by piercing with a small, sharp knife. Lift out of the pan and leave to cool slightly on greaseproof paper. Increase the heat of the fryer to 180C. Season the fish and dust lightly with flour. This enables the batter to stick to the fish. To make the batter, sift the flour and a pinch of salt into a large bowl and whisk in the lager to give a thick batter, adding a little extra beer if it seems over-thick. It should be the consistency of very thick double cream and should coat the back of a wooden spoon. Season with salt and thickly coat 2 of the fillets with the batter. Carefully place in the hot fat and cook for 8-10 minutes until golden and crispy. Remove from the pan, drain and sit on a baking sheet lined with greaseproof paper, then keep warm in the oven while you cook the remaining 2 fillets in the same way. Once the fish is cooked, return the chips to the fryer and cook for 2-3 minutes or until golden and crispy. Shake off any excess fat and season with salt before serving with the crispy fish. If liked, you can serve with tinned mushy peas and bread and butter, for the authentic experience!